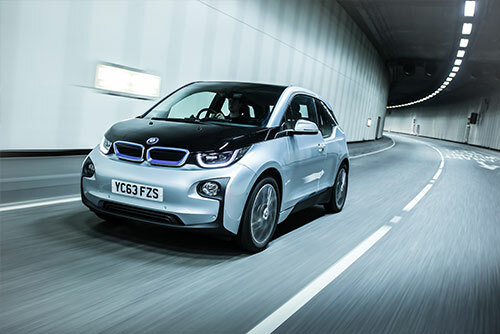 BMW i3 awarded UK Car of the Year 2014 top prize. BMW’s i3 has been awarded the title of UK Car of the Year 2014, at the inaugural awards ceremony. The new BMW i3 is the first ‘i’ model launched in BMW’s new two-car ‘i’ range. The first i3 megacity customers in the UK received their cars in February 2014, while deliveries of the plug-in hybrid i8 sports car are due to start later this year. The i3’s electric motor generates 170hp, with peak torque of 184 Ib ft available instantly. This allows the BMW i3 to sprint from zero to 37mph in just 3.7 seconds and zero to 62mph in just 7.2 seconds. The i3’s lithium-ion battery gives the car a range of 80 –100 miles in everyday driving. This can be boosted by as much as 30% using one of the car’s two ECO PRO modes. For drivers conscious of ‘range anxiety’, the i3 is available with a small 650cc two-cylinder petrol ‘range extender’ engine. This powers a generator that maintains the battery charge while on the move. The use of lightweight CFRP for the passenger cell compensates for the weight of the battery, while the low, central location of the battery pack maintains agility thanks to a low centre of gravity and 50:50 weight distribution. The UK COTY awards aim to provide an independent set of awards for the car industry, highlighting the best vehicles in the market across a range of categories. 27 journalists judged cars across 12 categories for the first UK Car of the Year awards. Both BMW i3 models include a three-year, unlimited mileage vehicle warranty and an eight-year, 100,000 mile battery warranty. The battery is also included in the price of the car negating a separate lease charge for battery, as is often the case for other electric vehicles. The BMW i3 is priced from £369 a month* or £25,680** OTR. The BMW i8 will go on sale in the UK in 2014 priced at £99,845 OTR. **With £5,000 OLEV Government grant.